PowerFest 2018 promises to be the largest yet. partypoker has once again raised the bar with their signature Powerfest series. The Fall iteration features an astonishing $60 million in guarantees spread across High, Medium, Low, Micro as well as High Roller and Super High Roller events. 147 events are on the schedule which equals 670 total tournaments, a new high-water mark for partypoker. Buy-ins range from a meager $1.10 to the monstrous $25,500 Super High Roller that comes with a staggering $3 million guarantee. partypoker is shooting for the moon from September 2-23 in their latest attempt to shift the September online marketplace in their favor from PokerStars. The marquee events on the Powerfest schedule are the 20 Championship events. Eight of those events come with a title-fight price of $5,200. All $5,200 buy-in Championships are accompanied by a $1 million guarantee. The festivities start right away on the first day of Powerfest. Event #3-High is one of the $5,200 events and is a standard No Limit Hold’em MTT. Three of the $5,200s feature the Progressive Knockout Bounty format. Those events are numbers 49, 75, and 102. 11 of the 20 Championship tournaments are PKO with buy-ins going from $3,30, $16.50, $55, $215, $1,050, and topping the mountain at $5,200. All four of the $1,050 Championships are PKOs. All Powerfest PKOs set aside half of the tournament buy-in to use for the progressive bounties. Only one Pot Limit Omaha tournament is on the Championship list. Event #111 on September 18 is a $10,300 with a handsome guarantee of $500,000 and played in the Six Max realm. The largest Championship of them all is the $25,500 $3 million guaranteed. The event plays in the Eight Max format and starts on September 22 as #122 on the schedule. PLO spreads across 22 of the 147 Powerfest events with all of them to be run as Six Max. PLO8 is involved as well. Six of the 22 PLOs are PLO8 and the highest buy-in available is for $530. partypoker returns the fun Mix-Max format to the online world. 25 events utilize the setup that operated as a World Series of Poker tournament until the end of 2014. Standard rules for Mix-Max are for events to start nine-handed, shift to Six Max, and then Heads Up until a winner is reached. Structures are not yet available for Powerfest and the official rules for Mix-Max are to be discovered then. 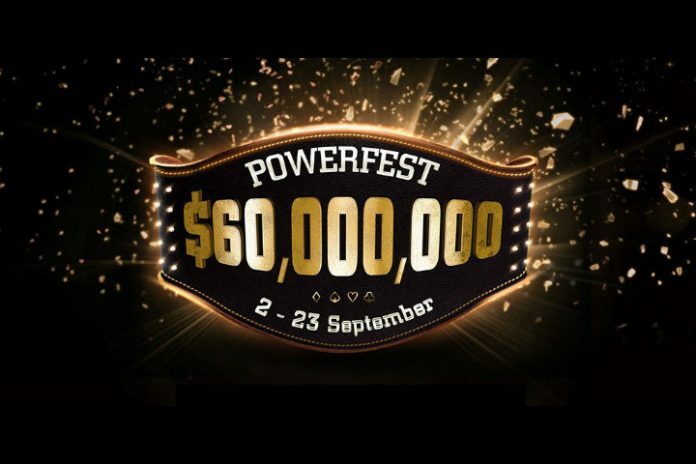 PocketFives will have daily Powerfest coverage beginning September 2.